Maybe because I’m reading John Kenney’s excellent novel, Truth in Advertising, I’ve been thinking a lot about authenticity in brand marketing and public relations. It’s one of those things that we take for granted when present, but that can be a time bomb when absent. Yet, when I first heard about the lawsuits served up against Subway for misrepresenting its footlong sandwich, they seemed pretty half-baked. One complaint calculates that by shorting customers as much as an inch over a period of years, Subway has amassed $142 million in deceptively earned revenues. Another asks for $5 million in damages for a loyal customer due to false advertising. That’s a lot of dough. Who takes these seriously? Is it a plot cooked up by Quiznos? More likely, it’s the law firm that wants to make a reputation for itself by building a class-action case over a truth-in-advertising issue that could be widely applicable. The firm had someone test the footlong sandwiches in 17 Subway restaurants, and all were a half-inch or a full inch smaller than the requisite 12 inches. So there’s a real issue here, no matter how you slice it. Size matters, and so does truth in advertising. 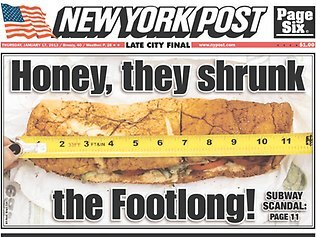 But where Subway really fell short, with pun intended, was in its initial response to the feeding frenzy. It claimed that “footlong” is simply a generic name, not to be taken literally. Really? Hard to swallow, because Subway has based its marketing on the length of the footlong sandwich from the product’s launch. It even sued a convenience chain who used the term, rejecting their argument that it’s a “generic” name. Subway quickly changed course, blaming inconsistencies in the dough kneading, rising, and baking process for the difference in sandwich size. Kind of like “Contents may settle during shipping.” It’s a more palatable explanation, but it still doesn’t measure up. When customers feel cheated, they want to know what you will do about it. Sometimes a simple apology, coupled with a pledge to make it right, will suffice. In a classic case of too little, too late, the chain botched its response, prolonging the food fight. On Thursday Subway finally released a statement of apology for the substandard subs, pledging to work harder to hit the 12-inch size and achieve sandwich uniformity. And, no doubt, customers will hold them to it.